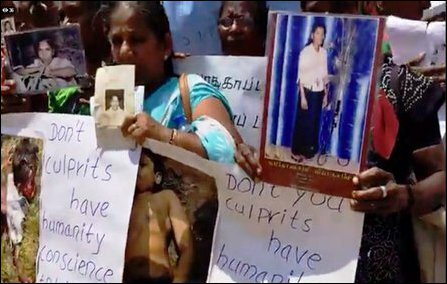 The community of Jaffna University, comprising students across all faculties, marched with the families of enforced-disappeared persons, relatives of political prisoners and the uprooted families, demanding international justice to the protracted genocide against Eezham Tamils on Saturday. 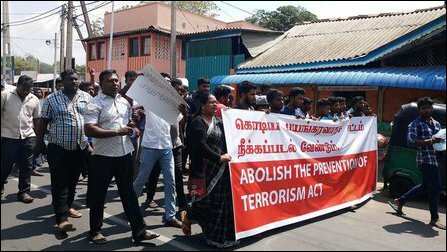 The protesters marched from Jaffna University to the old municipal square, walking a 4 km distance without causing any hindrance to the public life in the city. 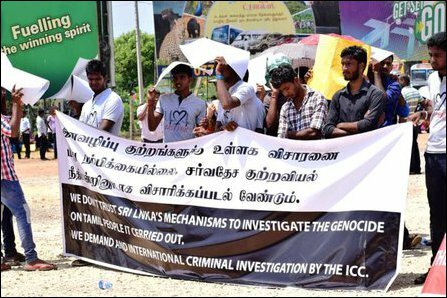 The march drew participation from across the society sending a strong message to the international community not to provide anymore extended escape-routes to the SL State at the UN Human Rights Council in Geneva. Activists of the grassroots organisations supported the march and representatives of the student community at the Eastern University took part in the parade. Tamil National Peoples’ Front which is led by Gajendrakumar Ponnambalam, Tamil Makka'l Kooddda'ni (TMK), led by former NPC Chief Minister C.V. Wigneswaran and other politicians, including those from the detracting ITAK led by Mavai Senathiraja took part in the walk. 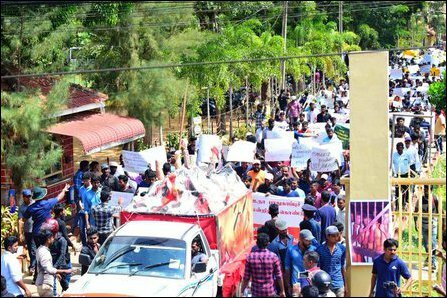 The student society of the University of Jaffna had mobilised for two weeks staging a village-by-village campaign, and the march became a big success. 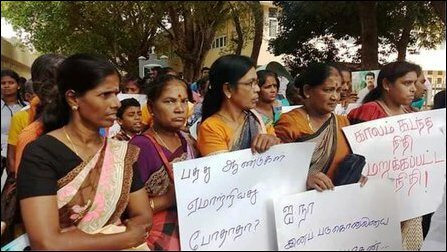 The protesting families of enforced disappeared persons from the five districts of the North, and the uprooted Keappaa-pulavu protesters marched along with the students articulating their claims. Some Sinhala students also took part in the mobilisation. The protesters said they had no trust in local (internal) mechanisms, demanded an international investigation on all crimes including genocide. 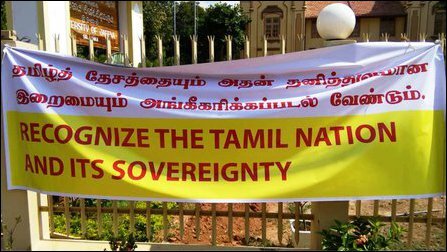 They also carried slogans urging the international community to recognise Tamils right to self-determination and sovereignty. 01.04.19 Sumanthiran's rationality exposes Wigneswaran's gu..
22.03.19 UNHRC ‘Sri Lanka’ roadmap premeditated not to deli..
16.03.19 Students mobilise big march in Jaffna, demand just..